Meals: In Mongolia breakfast, lunch and dinner. Schedule 2017: June 10-June 20, July 15 – July 25, August 02-August 12, August 15-August 25. Highlights: Ulaanbaatar: Zaisan Memorial, National History Museum, Gandan Hiid Monastery, Terelj National Park. Nomadic family visit. Irkutsk- Lake Baikal, Matryoshka factory with master class and museum of Cheburashka. Day 1. Arriving in Ulaanbaatar - City sightseeing tour. National folk and dance concert. Overnight in hotel. Day 2. Driving to Kharkhorin - the ancient Mongolian capital. Visit to the Erdene Zuu monastery - the first Buddhist center of Mongolia. Day 3. Driving to Ogii Lake - It covers 27 square km and is rich of fish, and bird life such as swans, geese, white spoonbills and Dalmatian pelicans. Relaxing time at the camp. Optional activity: walking or horse riding and fishing. Overnight in Ogii camp. Day 4. Trip turns back towards Ulaanbaatar. On the way we will have stop at Hustai national park to watch Takhi wild horses which have been reintroduced to Mongolia during last 15 years by the support of Danish government. Day 5. Continue driving and arrive in Ulaanbaatar before the noon. Free time and optional shopping. In the evening take an evening train to Siberia, Russia. Day 6. 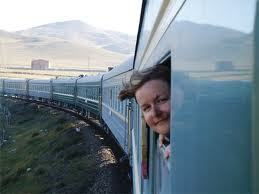 Train ride, crossing the Mongolia - Russian borders and arriving in Ulan Ude. Overnight in hotel. Day 7. City excurtion. Visiting local History Museum, Ivolginsky Datsan - the only Buddhist spiritual centre of Russia. Take an evening train to Irkutsk. Day 8. Morning arrival in Irkutsk. City sightseeing tour that will include visits of the oldest historical part of the city, famous Znamenskaya Central Orthodox Cathedral, other atmsopheric sights, then tour the Decembrists' Museum inside the Prince Volkonsky Mansion. Russian cuisine. Overnight in hotel. Day 9. Transfer to Baikal lake. Visiting in Listvyanka - Taltsy Museum of Wooden Architecture Museum and the Limnological Museum. Then walk up to the Tchersky Peak. 1 hour boat ride on lake Baikal. Overnight in hotel. Day 10. Transfer to Airport. Depart from Irkutsk to Moscow.